We are located within a mile of junction 9 of the M6 in the West Midlands. Exit junction 9 take first exit left onto A461 to Wednesbury. Keep left and take first slip / turning off to left to loop round under the A461. At the roundabout take the last exit right onto Axletree Way. After a quarter of a mile at the next roundabout (Entrance to Ikea on right) go straight on (passing B&Q on left). Next island second exit straight on. Next mini island turn right going straight on to another mini island where you turn sharp left into Heath Road. 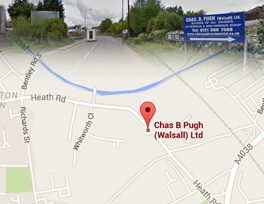 After a quarter of a mile turn right into industrial area Chas B Pugh (Walsall) is on the right. Exit junction 9 take third exit right onto A461 to Wednesbury. Follow the instructions as above.